Bring the sea into your home! The inspiration behind these coastal designs came from long walks on the beach, gathering shells. If you’ve done it, you know the feeling! Salt air, warm sunshine on your face, sand between your toes, blue skies and the roar of the ocean! I moved to the beach to enjoy all these wonderful things! Now, I'm inspired to bring them into your home! 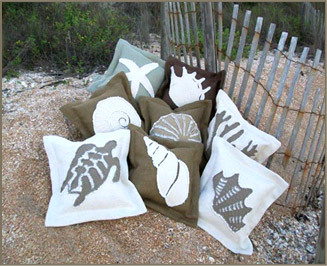 My custom product line started with Coastal Sea Pillows and quickly grew to include Canvas Sea Pillows, Beach Bags, Home Decor, Coastal Bedding, Coastal Dining, Wine Bottle Bags and Jewelry. Seasonal items include a full line of Beach Christmas including Coastal Stockings and Tree Skirts. The entire product line is custom made. All products are made from 100% Natural Textiles, canvas, cotton and shells from the sea! Keeping it green, and all made in the USA! The color choices are subtle and combinations are numerous, so sit back, relax, and enjoy picking up shells! For wholesale pricing information and details, please submit our wholesale request form.